A report by Pam Barnes. What is the role of education and civil society in the promotion and transmission of ‘A Union of Shared Values’? 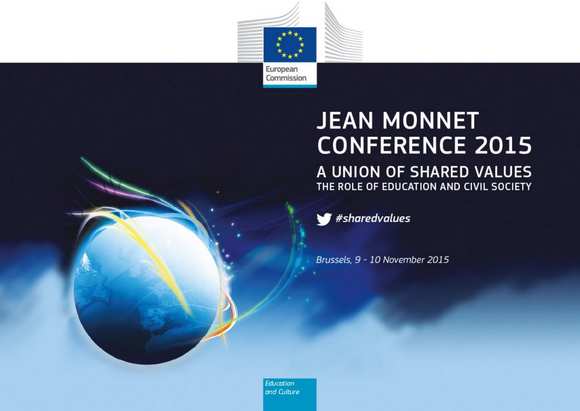 This was the topic of the Jean Monnet Conference 2015, which took place in Brussels on 9/10 November. Only a few days later the horrific events in Paris on 13 November have highlighted not only the relevance of the question, but also the urgency of answering it in an appropriate manner. More than 300 members of the Jean Monnet network of Professors and Scholars had gathered at the event, together with officers of the Directorate General ‘Education and Culture’ and team members of the competent Executive Agency. Commissioner Tibor Navracsics, responsible for Education, opened the conference. The EU-Asia Institute at ESSCA School of Management was represented by Wei Shen and myself, who had been invited by the European Commission to join with the other Jean Monnet Professors from 72 different countries around the world that were present at the conference. A particular impetus for the conference and its thematic focus had come from the terrorist attack on the office of the satirical magazine Charlie Hebdo last January. Following this tragic event, the Education Ministers of the European Union’s 28 member states and Commissioner Navracsics had published in March a declaration on the role of educators as supporters of the shared European values of freedom, tolerance and democracy. The objective of the intensive discussions that were held at the conference was to debate the contribution that academia can make to policy-making in order to support and protect the shared European values of human dignity, freedom, democracy, equality, the rule of law and respect for human rights. These values are clearly stated in the Treaty on European Union and they are at the heart of the very foundation of the European Community after World War II. They are of course not unique to the EU, but they represent what we would hope are the foundations of any free and democratic society. What is unique about the EU, however, is that as a group of countries we have committed ourselves to a considerable effort of cooperation and collaboration to ensure that these values are upheld. 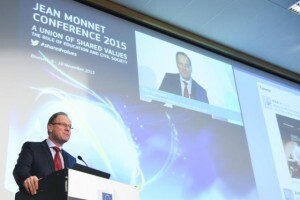 Tibor Navracsics opening the Jean Monnet Conference 2015. A number of issues were raised during the conference that are evident in European society today and have a direct impact on the core values of the EU. These issues included migration, discrimination, social exclusion, security and the financial crisis. The events in Paris last Friday have tragically highlighted the urgency of the task that educators must assume in order to ensure that the relevance of these shared values is appreciated and put into action at all levels of society. We are all affected by the attacks. Educators have an crucial role and important responsibility to use their position and their skills as communicators to disseminate knowledge and understanding of Europe’s core values. They must work together across national borders to share their practices and experience in the development of awareness and understanding of these values. How educators can teach, mobilize and energize the young to engage in a wide-ranging and open debate about our shared values was a question that provoked much discussion during the conference. In higher education establishments it is possible to provide a non-threatening environment in which students may experience and appreciate ideas from other cultures and traditions and establish life-long friendships based on openness and tolerance of each other’s ideas. It will be an essential task to uphold the freedom of expression in this environment and enable young citizens to become supporters of the values that make democracy and freedom possible in Europe. and Research Associate at the EU-Asia Institute. Follow us on Twitter: @Essca_Eu_Asia. More information on the Commission’s web page on the conference, where more documents from the conference are to be made available in the future. This entry was posted in Democracy & Citizenship, Society & Culture, The EU and tagged Brussels, citizenship, democracy, values. Bookmark the permalink.